Beauty Costs > How Much Does Jade Cost? How Much Does Jade Cost? Jadestone, which is popular in China, is more popularly known as Jade, a name meaning two different metamorphic rocks made up of different silicate minerals. Jade is commonly used in charms and different pieces of jewelry and was even seen being used as weapons since the prehistoric times. The most expensive type of jade, known as imperial jade, will come from Myanmar, but some can be found in parts of Mexico and Russia. This type alone can start at $1,000 per carat. This jade will have a deep green color and is considered to be very rare. Close to 75 percent of jade comes from British Columbia mines, while the rest comes from the United States, Taiwan and Australia. The costs will depend on the type, quality, cut, color, characteristics, size and where it’s purchased from. With so many factors involved, prices can be as little as $1,000 to more than $100,000 for a high-quality gem, and the higher price, as of late, is due to China’s economic rise. Forbes says it’s not unheard of to see the stone command prices as high as $3,000 per ounce, making it more expensive than gold. In this same article, one man went to a local market and saw jewelry pieces selling as high as $100,000, while smaller pieces were as little as $1,000. The Gemological Institute of America Inc. says the three most important qualities will be the color, transparency and texture. As the size is expressed in millimeters, the slight differences in size can make a large difference in value. As for a jewelry, a popular piece, such as a bangle bracelet, can easily cost $5,000 to $8,000+, depending on the color, transparency, and intensity. This gem will be divided into three categories: Type A, Type B and Type C. Type A is a natural, untreated stone that will have no artificial treatments and no “true” color. Type B will be chemically bleached to remove any impurities and will be injected with a polymer to enhance its translucency; it will also be covered with a hard plastic-like coating and will still retain its 100 percent natural color. Type C will be chemically bleached and dyed to enhance its color but will be subject to discoloration due to strong light and/or body heat. Jade can come in various grades, but will only two will have a chemical formula: Jadeite and Chinese Nephrite. Jade can come in yellow, white, brown, orange; however, the most common color is green. Apple green, lavender and mauve colors can be popular as well. Color can be a big influencer with the price, and as mentioned above, Imperial Jade, which is a gem the royal court of Chine once had a standing order for, is one of the world’s most expensive gems. In a distance second place, lavender can be worth more than most other colors. Its transparency can range from opaque to a semitransparent, which means you can read right through it. Semitransparent types tend to be the most popular because of the light that’s able to penetrate the surface, creating an alluring brilliance. 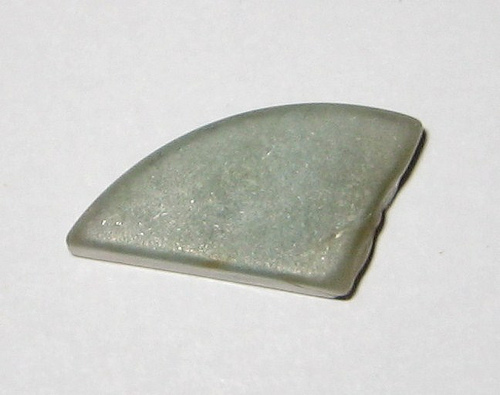 Opaque stones can often have cloudy patches which break up the transparency. The gem’s texture, depending on the size, will have a smooth touch and can either be coarse, fine or medium, with a variation in between. The finer the texture is, the higher the value may be. Often cut into cabochons to be used in jewelry, a good gem will be carved smoothly and will have no flaws or unevenness to the naked eye. A popular piece of jewlery such as the bangle bracelet will be formed from a large amount of rough stone to create an almost perfect treasure. Some gems may also be cut into round beads which can be matched for strands. If you purchase jade as a raw stone and want to turn it into a jewelry piece, you may have to pay for the design and/or implementation, depending on the seller and jeweler. With many imitation gems on the market, one way to see if jade is real is simply by tossing it in the air. Since jade can look heavier than it appears, it will have a heavier feel as it hits your palm. While this isn’t a precise test, it can be effective if done right. Another way to test is by tapping the stones together to judge the density and sound. If it sounds like plastic clinking together, it may be a fake, but if there’s a deeper sound, there’s a good chance it’s real. Again, it can be hard to distinguish real from a fake, so it’s always best to talk with a reputable jeweler to confirm its authenticity. Jade is the hour birthstone for those born between 9 and 10 p.m. These stones are tough, but they aren’t considered the toughest on the Mohs scale, which is the scale designed to measure the resistance to scratching. The wearability is great and natural, untreated stones are able to withstand a mechanical cleaning. For those who are unsure of how to clean their gem, a simple warm water and detergent blend will suffice.